This entry was posted on May 12, 2015 by Jessica Anderson. Over the course of an athletic career, players have the opportunity to earn many trophies. We get asked by our customers often what is the best kind of trophy to buy at a particular age. With so many choices available, it’s hard to know which award is appropriate. Below are some general guidelines for providing meaningful recognition during any stage of an athletic career. 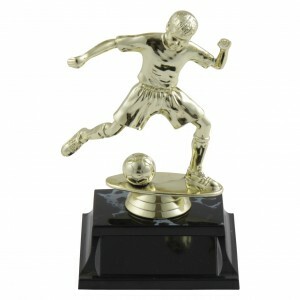 This youth soccer trophy is a great choice for a beginning player. Younger Children: I recommend that younger children participating in sports for the first or second time receive small participation trophies. Starting small allows something for the kids to look forward to in the future, as they grow bigger. Popular options include bobble head trophies, trophy figures on bases, or trophies with a child figure. Older Children: As children get older, they usually receive larger participation trophies. For school-aged kids, trophies with column are a great choice. These awards come in a variety of solid colors, including red, blue, green, and purple. In the future, we'd like to offer more interesting color choices that match team colors such as lime green, marmalade orange, teal blue, and vivid pink! After a few sports seasons, storage space on bedroom shelves can become scarce. For trophy alternatives, medals and dog tags are great options. They can be worn like a necklace or clipped onto a backpack. Other popular options include water bottles and clothing, such as team jackets, hats and scarves, and other sports related apparel. 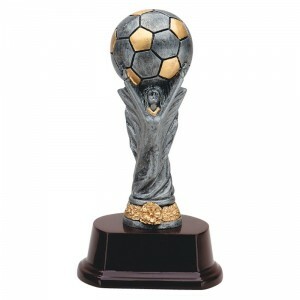 This replica World Cup Soccer trophy is a great choice for older kids or for larger achievements. Tweens: Resin trophies are a popular choice. Resembling pewter, resin awards look like statues and feel heavier than other trophies. They usually cost a couple of dollars more than other participation trophies but have a cooler, more mature look, making them a great choice for older kiddos. Teens: As kids grow into their teens, participation trophies are less often awarded. Sports teams receive hardware when they win competitions or reach certain goals, such as becoming District Champions or winning large tournaments. When this occurs, the team wins a large trophy. Players can also receive recognition for individual accomplishments, such as “Most Valuable Player,” “Most Inspirational Player,” or “Most Improved Player.” Common awards for teenagers include sports plaques, resin plaques, larger post trophies, or championship resin trophies on large bases. Adults: Most trophies given to adults acknowledge tournament or league winners. Fantasy football, bowling, and golf are all examples of leagues that give trophies to their winners. Many leagues award perpetual trophies, which are passed from person to person year after year. For golf, tennis or poker tournaments, the first, second and third place finishers usually receive awards. These awards can be large or small, depending on your needs. One of our best sellers, toilets make great gag trophies for fantasy football, golf, and office parties. For fun, many groups tease their losers with special trophies. Examples include beauty queen or toilet seat trophies for worst performance in a fantasy football league or pink chip trophies for first out at a poker tournament. Joke trophies are a great way to add some humor and laughter to your event, and are a huge seller for us. I hope these general guidelines help you choose a great award for your favorite player. From young children starting their athletic careers to adults participating in tournaments for exercise and fun, everyone appreciates meaningful recognition. Editor's Note: This post was originally published in March 2014, and has been updated for accuracy and comprehensiveness.